Federico Ghizzoni is Chief Executive Officer of UniCredit. He was born in Piacenza, Italy on October 14, 1955. He holds a degree in Law from University of Law in Parma and started his career in 1980 at Credito Italiano’s Piacenza Branch. Between 1988 and 1989 he assumed the position of Branch Director in Trieste and continued his career as Director of Seriate Branch. In 1990, Ghizzoni was appointed Deputy General Manager to Credito Italiano’s London Office. 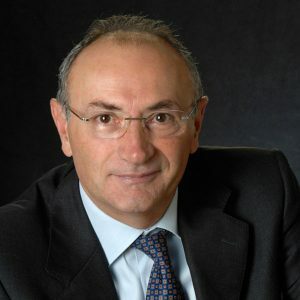 After having been appointed General Manager at the Singapore Office of Credito Italiano in 1995, Ghizzoni was Executive Director responsible for Corporate and International Banking from 2000 to 2002, at Bank Pekao S.A, an affiliate of UniCredit Group. In 2003 Ghizzoni moved to Turkey as Executive Board Member at Koç Financial Services and as General Manager at Yapi ve Kredi Bankasi. In July 2007 Ghizzoni was appointed Head of CEE Banking Operations and Deputy CEO at Bank Austria AG. In August 2010 he assumed the position of Deputy CEO and Deputy General Manager of UniCredit. From 2010-2016 he was Chairman of the Supervisory Board of UniCredit Bank AG in Munich and Member of several Boards of Directors of international financial institutes. Ghizzoni is also Chairman of the Orchestra Filarmonica della Scala Association in Milan. Since 2016, he has been Executive Deputy Chairman at Clessidra SGR SpA.